Action from City of Peterborough's win over Cambridge City. Photo: David Lowndes. City have to win at the home of their deadliest rivals to have a chance of overtaking either Teddington or Brighton and clinch a top six berth and with it a place in Division One of a restructured National League next season. Teddington and Brighton play each other and if they draw City would need to win handsomely in Cambridge to achieve their goal. Any other result and City would finish six if they pick up three points. They travel in good spirits after scoring twice in the final three minutes to beat Old Loughtonians last weekend. Elsewhere Simon Buckley claimed a hat-trick as City fourths won 5-3 at Leadenham in East Division Three North West and teenager Max Etherington was on target twice as City sevenths beat St Ives 3-1 in Division Seven North West. City of Peterborough Ladies finished a lacklustre East Premier Division campaign in seventh place after losing their final game 3-2 at Canterbury seconds. City fought back from 3-0 down with two goals from Amy Wells, but couldn’t find an equaliser. Isobel Hughes and Felicity McArthy scored the goals as champions City seconds made it 20 wins and a draw from 21 Division Two North West matches with a 2-0 success at Cambridge South. They should complete an unbeaten season at Pelicans on Saturday. Division Four North West champions Bourne Deeping seconds reached 100 goals for the season by beating their own third team 5-0. Helen Darragh scored twice, including the 100th goal, for an unbeaten team who have won 19 of 20 fixtures. City of Peterborough’s run in the National Mixed Cup came to an end at the hands of Norwich City on Sunday. 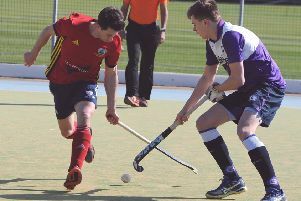 It didn’t help that key men played a tough National League match immediately prior to the mixed game, although one of them, Brendan Andrews, made it 2-2 with the last shot of the match. Nathan Rosario had given City an early lead, but Norwich won the penalty shootout 5-4.